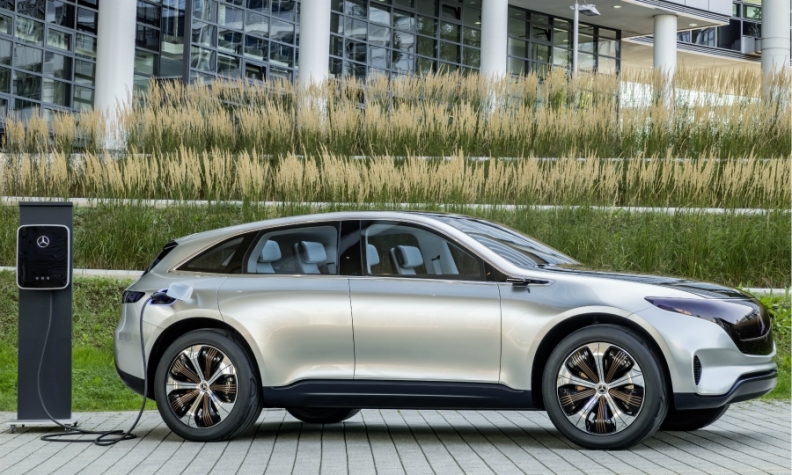 Mercedes plans to launch an electric SUV based on the Generation EQ concept, shown. BERLIN -- Daimler and its Chinese joint venture partner BAIC Motor agreed to upgrade the Mercedes-Benz factory in Beijing to make electric cars. At a signing ceremony in Berlin on Thursday attended by German Chancellor Angela Merkel and Chinese Premier Li Keqiang, Daimler signed a framework agreement to upgrade production facilities at Beijing Benz Automotive to make New Energy Vehicles, a label for so-called low-emission vehicles which include hybrid and pure battery electric cars. "China today is already the world’s largest market for NEVs, and Daimler is committed to contributing to the further development of electric mobility in this country," Hubertus Troska, Daimler's board member in charge of China, said in a statement. Daimler also agreed to acquire a minority stake in Beijing Electric Vehicle, a subsidiary of the BAIC Group, to enhance collaboration on developing so-called new energy vehicles. Daimler declined to provide a figure for the scale or value of the stake. BJEV was established in 2009 by the BAIC Group and other shareholders as a development platform for New Energy Vehicles. It focuses on research and development, production, and sales and services for New Energy Vehicles and core NEV components. To date, the company's product portfolio covers five major series of electric vehicles. Daimler's factory with BAIC in Beijing currently builds Mercedes vehicles powered with conventional combustion engines. The German automaker also produces an EV in a joint venture with BYD under the domestic Denza brand. Daimler's Mercedes cars unit aims to launch more than 10 new electric cars by 2022. The first, an SUV based on the Generation EQ concept, is due in 2019.